With the Millennium Development Goals (MDGs) about to retire and the more elaborative Sustainable Development Goals (SDGs) ready to take ﬁeld, the focus now is on the targets associated with the goals, the indicators to be used to gauge the progress of countries and the reforms needed to ensure that the proposed SDGs are met within the next 15 years. 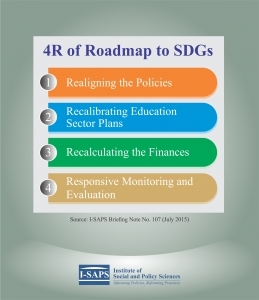 I-SAPS has been working to inform policies and reform practices in the education sector of Pakistan. With the MDGs not being achieved by Pakistan, there is a need to re-align the priorities so that the post-2015 agenda can be achieved. 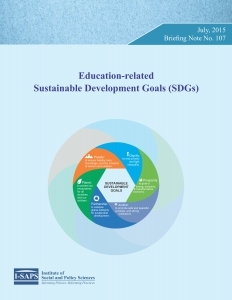 This document provides an overview of the education-related SDGs, Pakistan’s progress on MDGs and suggests 4R of the roadmap to SDGs.